Photo by: Archiv & Jan VágnerIn an era of tired fast food, one company found success offering something fresh. The Crocodille sandwich company has arrived big-time, as a popular entrée in the diets of grateful diners. YOU’VE SEEN them in grocery stores, gas stations and even small “trafika” or food kiosks. A combination of good marketing and attention to consumer tastes has made Crocodille a local favorite – while the competition goes stale on the shelves. Between the bright yellow flags outside and the special refrigerated boxes inside, it’s difficult not to notice the company’s offering in local shops. “We just abide by the rules of the game in selling our products,” says the firm’s commercial director, Jiří Jelínek. Those rules include making sure that, whenever possible, they reap the benefits of impulse purchase, which requires prime positioning in the shop floor. Likewise, the signature flags were designed – with color, logo and an appealing product photo – to capture attention and inspire a craving. Crocodille’s credoThis could be stated as “Another kind of cuisine” – that is to say, the possibility of eating, in a manner suitable to speedy lifestyle of the modern consumer, a whole range of goodies that one might normally get in a restaurant. Just as importantly, the firm’s offering is well within the budget of the average shopper; its most expensive sandwich cost 45 crowns at most outlets. Through its R&D team the company tries to ascertain a “profile” of modern diners: what tastes might appeal to him or her, what eating patterns are becoming commonplace among people on the run. By digging into more international inclinations, Crocodille has invented sandwiches that might be considered “exotic” by local standards. For this reason, “traditional Czech cuisine is not our competitor”, says commercial director Jiří Jelínek. Crocodille recently enjoyed its 10th anniversary, and the firm has good reason to celebrate. With a turnover of nearly CZK 500 million in 2001, and “steady growth in terms of tens of percent every year,” according to owner and general manager Petr Cichoň, it has reached a dominant position in its market segment. As Cichoň (28) puts it, the company set out to exploit a niche, as “this product category did simply not exist here 10 years ago”. They started from scratch and built the company’s reputation over the years. Those familiar Crocodille banners can now be seen throughout 80% of the nation, with approximately 2,500 points of sale and 40 delivery routes. The firm’s steady growth is also reflected in its number of employees, currently at 350, and increasing at the same pace as turnover. Cichoň’s active merchandizing philosophy can be seen in the firm’s distribution channels. A strong presence in the retail sector, such as supermarkets, small grocery shops and gas stations, compensates for the relatively weaker position in venues like bars and take-away outlets. Further, a prominent and distinctive logo, which appears on everything from the sides of delivery trucks to employee’s clothing, constantly reinforces brand recognition. Cichoň summarizes Crocodille’s first decade of success as the result of a “harmonious and continuous development, without upsets”. He originally entered into the baguette business back in 1991, under the umbrella of his father’s company Stavinvest, which engaged in activities ranging from real estate development to catering and hotel management. At the time, Stavinvest was inactive, and in 1996 it was renamed Crocodille Fast Food Praha, and Petr joined the firm’s statutory board. In 1997 the family company decided to launch the sandwich product line, incorporating a special packaging process. Two years later, Petr’s father handed over the reigns, leaving his son as the single shareholder and general manager of Crocodille. Under Petr’s tenure, the firm acquired its current name of Crocodille ČR in 2001. Although the firm has sought to keep in line with “world trends in the business”, Cichoň says that he wanted to do so without relying on foreign investors. A good example of this came in 2000, when the company introduced so-called thermo-forming technology (see sidebar, p. 33) into its production line – an accomplishment realized solely with its own capital. Another stand-out Crocodille strategy is its full vertical integration: not a single chance is left to the odds of the market, not a single segment of the business chain is subcontracted. The company controls the whole process, from the making of the bread to the delivery of the finished product to small independent food shops across the Czech territory. The company has two production centres in the Czech Republic, one in Prague and another in Žiželice nad Cidlinou, both of which house a fully-equipped bakery. Quality is a term often used by firm representatives. For Crocodille, it boils down to fresh ingredients and the development of recipes which reflect world trends in gastronomy – albeit served in the form of a sandwich. This is where Crocodille can show its teeth, because its attention to gastronomy also applies to technology, an area where competition is decidedly less fierce. Answering consumer demand, the firm added regular sandwiches to its baguette line late in 2000. Overall, the whole range of sandwiches, six total, are doing well, and Crocodille consumers have indicated a clear “winner” – the Mexican Chicken sandwich, with maize-tomato bread, pieces of roasted chicken, spicy “salsa” and fresh salad. This type of ethnic offering, which is proving so successful, was carefully examined before being put into production. Other exponents of this trend towards “global gastronomy” are the chicken curry sandwich (with Indian spices), and the prawn sandwich with lemon and lettuce – a taste one typically associates with seashore resorts. While the current product range includes ethnic influences from Mexico to India, between 2002 and 2003 the firm plans to add 5-10 new products to its portfolio, including risotto, pasta, wraps and salads. 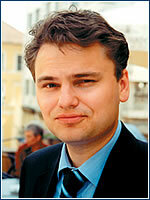 Jelínek feels certain that the market’s growth potential is far from being exhausted. 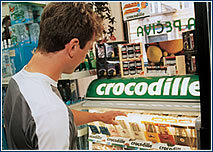 Fresh trendsTechnological development allows the Crocodille company to cater to various consumer trends. Besides running in-house bakeries to satisfy all its own production needs, the installation of a new, automated packaging line for sandwiches is paying off. After only one year, this segment already accounts for 25% of total business. The firm’s goal is stated at 50%, with the other half filled by the baguette business. The firm also implemented an investment plan in 2000, which in commercial director Jiří Jelínek’s words, lead to a “sandwich revolution.” Crocodille’s tactics are underpinned by a technology called “thermo-forming”, which incorporates vacuum packaging with protected-atmosphere injection. Thus all products maintain the taste and quality of their ingredients for the intended shelf-life duration (3-4 days). This is a clear advantage over fresh foodstuffs that go stale relatively quickly.